Duvetyne (Commando Cloth) Flame Retardant Blackout Cloth is commonly used for masking and draping where light reflection is undesirable. This version of Duvetyne can be used as a blackout cloth to black out windows and other openings in order to create a darkroom for photographic processes. It can also be used as a backdrop for photo and video productions. This item # is for a single, 54" wide cut of fabric that measures 1 yard long. For multiple yards, more than one cut may be made, but total length will match the quantity of this item ordered. CARE WARNING: Washing will remove flame retardant. 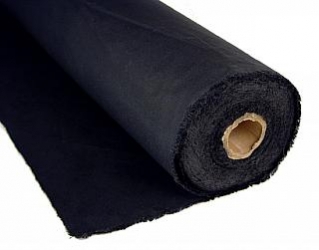 PRODUCT NOTE: This material is cut from a larger roll, with sewing/thread lines at intervals. These are not light tight and are generally avoided, which is why you may receive more than one cut of material. If you would like a large quantity in a single cut, please contact us at info@freestylephoto.biz.